STI is setting a new standard with the 8 ply radial Roctane XD tires. 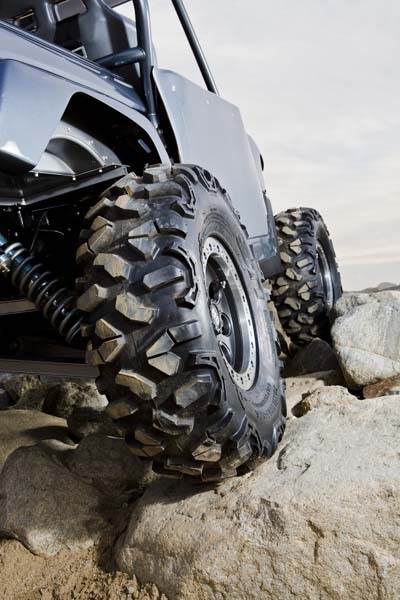 The roctane is a rock grippin' hunk of rubber that will take your ATV / UTV to new heights. It's tread compound is the latest greatest technology out there and is designed for the long haul. It's meaty tread will not leave you stuck in the mud. 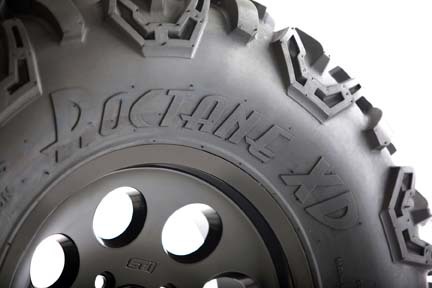 STI is making a statement that is sure to be heard in the ATV tire world with this all new Roctane XD tire. - STI Roctane tires are sold individually. 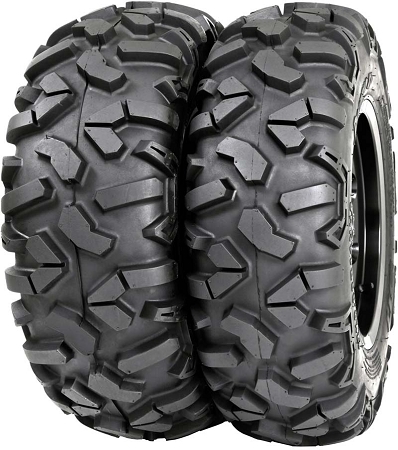 - Our STI ATV tires generally ship out within 1 business day! I purchased these meats to replace my original stock tires on my 2005 Polaris Sportsman 500 HO. No need to change rims, just have these new ones mounted on the stock rims if that's what you've got. So far, I've put about 100 or so miles on these tires and I'm really impressed with them. The traction is great, the tread grips really well, and the ride has been pretty smooth. I'm running them at about 5 PSI and just completed a trip where we had very rocky trails, slickrock, sand and hard packed soil. These tires handled all of the terrain varieties quite well. Would I buy these again? In a heartbeat! Order tires after looking at several others. These are by far the best tires I've own for my Kubota Diesel utv. Love them. Great price and service with this company as well. Will buy again. Bought the 28-10R-14 for my lifted 2008 Ranger XP 700 and put them on all 4 corners.Ive ran them through desert terrain I ride in and these tires are tough 8 ply with the bead design that protects the new STI beadlocks im using with them. Got them quick and after looking at so many tires im now enjoying these bad boys. Just had these mounted up on my '14 ranger 800. I ordered the 27's. Pure Offroad delivered them super fast and I'm pretty dang pleased. My tires are a true 27. In fact i think they actually measure 27 1/4-27 1/2-ish. They ride great and the ranger looks really good with the larger tire. No rubbing so far. Before purchasing the STI Roctane tires for our UTV prior to each outing we would refill our tire plug kit because we were always getting punctures and flats with our other tires we had purchased. And now the only reason we carry our plug kits are for those we run into or travel with that do not have Roctane tires. They are AWESOME in the rocks, clean out well in the mud and not noisey on pavement or hard surfaced roads. They are not a hard riding tire. I am very confident with these tires to go out in the Nevada outback. I recommend them to all my family and friends along with any other people come across while traveling the backroads and mountain trails of Nevada. Well worth the money. Confidence at an affordable price. I bought these tires for my rzr 800s. I travel to TN. Often and do a lot trail/rock riding and these are perfect for that. I love the wider stance these give my 800s. They are also true to size and are just over 28". I would recommend these to anyone who rides a lot of rocks. Great tough 8 ply tire. The 26X9R-12 rides good also. Ordered on line with fast delivery time. The tires are great. I hate most of the mud tires that feel like I'm driving down a railroad track. These are relatively smooth. They are very strong. I'm running 5 psi and accidentally ran over a few skinny tree stumps that would have punctured most tires. 8 ply is a must. Pureoffroad was fast with the shipping and I had these mounted to wheels. Great company, great product. Installed on front of Gator 825i, great tires, deep treads, looks good and the tires ride good,on or off the road..
Q: What is the weight for size 26x9-14 and 26x11-14? A: The fronts are 28 lbs. and the rears are 30 lbs. Q: What width of rim would the 34 x 10 15 be mounted on? A: 15x7 or 15x8. Either would work. Q: Is this price include rims? A: No, the rims are sold separately. Q: Are they true to size when inflated. what is tire actual tire height? A: Yes they are, I have 27 inch Roctanes on my own machine and they measure right at 27 inches tall when mounted and inflated. Q: I have a Polaris 900 , my tire sizes are 25x11-12 and 25x10-12, I am looking for this type our tire pattern and 8 ply tires and yet stick to original rims being as its a company utv and they frown on upgrading wheels? A: I would recommend buying these tires in a 26x9-12 for the front and 26x11-12 for the rear. They will fit your stock rims. They will be 1 inch taller than what you currently have. Q: How do these tires perform at high speeds? Will they shake my machine ? A: These are extremely popular tires that we've been selling for years for all-terrain riding. They are not highway tires by any means. I have used them myself and have driven up to around 50 mph without noticing any shaking or vibrating.